The annual cost to owners in the United States to repair, protect and strengthen concrete structures is estimated between $18-$21 billion, according to a 2004 report published by the ACI Strategic Development Council. Despite this substantial investment by infrastructure owners, the success rate of concrete repairs still needs improvement. For example, it has been reported that only a little more than 50% of the repairs performed on the US Corps of Engineers structures are performing satisfactorily. 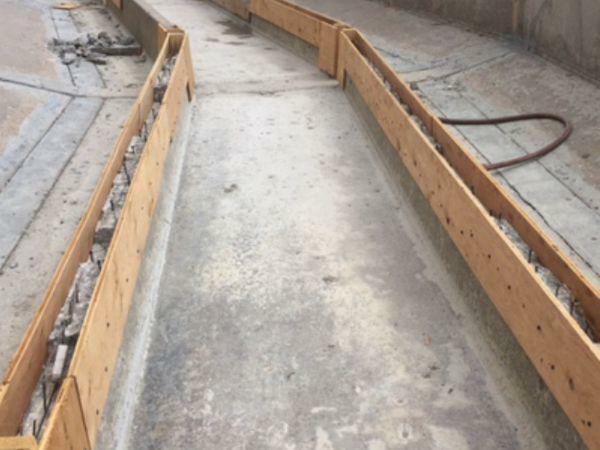 Long-lasting concrete preservation, repair and rehabilitation IS possible when knowledgeable and experienced professionals utilize sound concrete repair & restoration technologies. Preserving and extending the life of concrete structures is a process. The expected service life of concrete structures can be reduced due to many factors such as freeze-thaw resistance, alkali-silica reactivity, carbonation, poor original construction or inappropriate design. Successful concrete repairs begin with a condition evaluation to understand the root cause of the problem, with extra consideration given to repair design and implementation. For example, if concrete damage is due to reinforcing steel corrosion, the concrete repair strategy should consider Type 1 discrete anodes or concrete cathodic protection. If concrete damage is due to chemical attack, then the concrete repair strategy should consider ensuring that all of the contaminated concrete is removed and replaced with acid resistant concrete or portland cement concrete with chemical resistant coatings and linings. Preserving and extending the service life of concrete structures is a process. To achieve long-term extension of service life, there are many factors which should be considered. Click here for a detailed flowchart to help you navigate through the process of identifying common concrete repair issues. Concrete removal practices and surface preparation techniques are also important steps in the repair process and can have a major impact on the longevity of concrete repairs. Lightweight 15 lb. 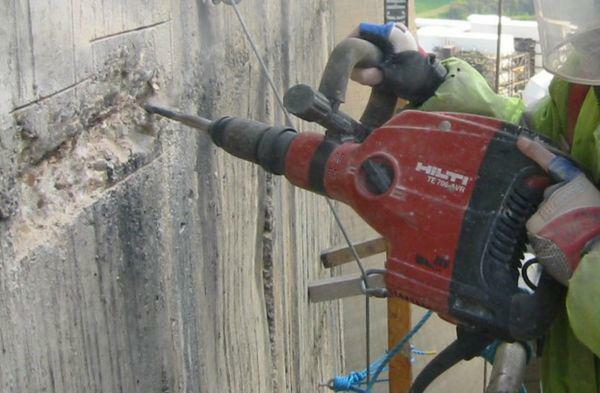 electric or pneumatic chipping hammers are used to remove deteriorated concrete without causing major damage to the sound concrete that will be left in place. 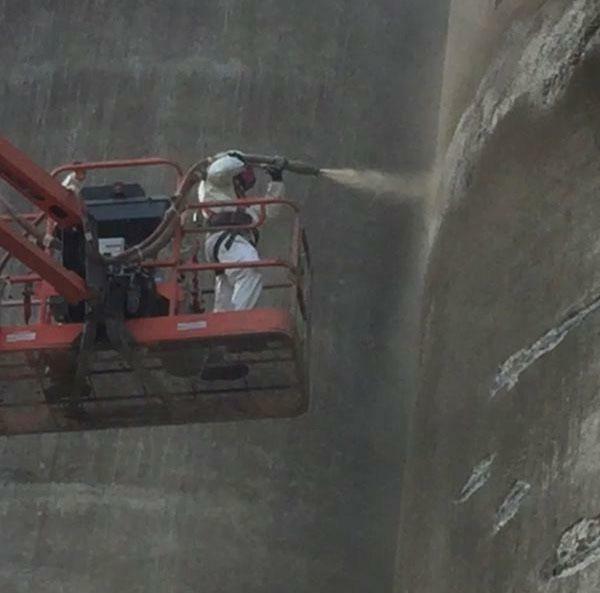 Hydrodemolition using high pressure water blasting is another effective way to remove bulk concrete. If heavier jackhammers or other methods like concrete scarifiers or rotomilling are used, special attention should be given to removing any microcracked concrete substrate and concrete removal around the reinforcing bars. 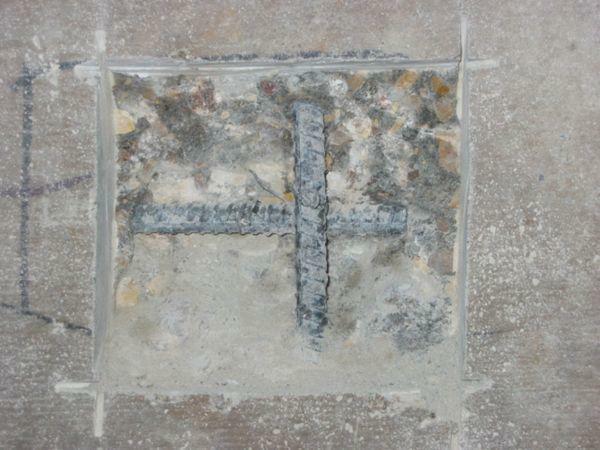 Unless some sort of cathodic protection system or electrochemical treatment are to be used, concrete removal should continue until the exposed steel no longer shows any substantial corrosion, even if it is necessary to remove some sound concrete. Another important consideration is the shape of concrete patches. The repairs should be simple in geometry - rectangular, square or some combination of both shapes – in order to minimize the formation of dying shrinkage cracks in the repair material that could affect bond or long-term durability. To define the patch edges and to minimize the potential for thin repairs at the extremities, sometimes referred to as featheredges, ½ inch to 1 saw cuts are used along the repair boundary. In a concrete corrosion repair & restoration construction job, the full circumference of the exposed reinforcing steel should be exposed sufficiently to allow the concrete repair technician to fully wrap their fingers around the rebar. All cement and corrosion products should be removed around the exposed reinforcing steel (rebar) to facilitate repair longevity and good bond. The parent concrete should be rough with a ¼ amplitude or greater which means normally some tips of coarse aggregate will be exposed. 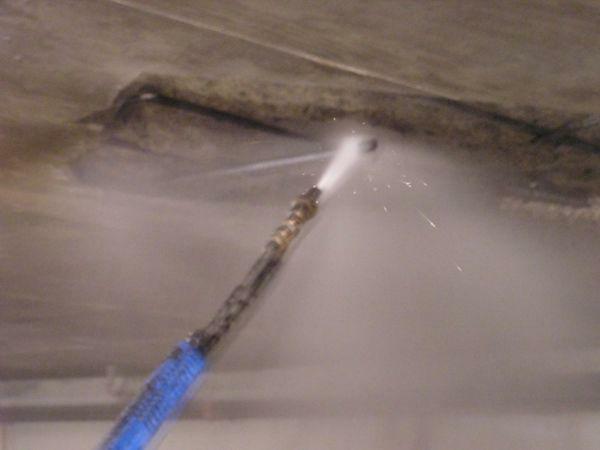 Before the concrete repair material is placed, the prepared concrete should be cleaned with abrasives or high-pressure water to remove any loose or deleterious materials that inhibit bonding of the concrete repair to the parent concrete. After the steel has been cleaned of cement and corrosion residue, what type of rebar treatment is recommended? There are several rebar protection options to consider. If the parent concrete is chloride-contaminated from deicing salts, exposure to saltwater, or other sources, then Type 1 embedded galvanic anodes (right) are used to protect from new concrete corrosion activity being accelerated adjacent to the repair due to the interaction of chloride-free concrete repair material and chloride-contaminated parent concrete. The use of rebar coatings like epoxy, cementitious epoxy, or zinc rich coatings provide additional protection to the steel within the repair. This is useful when the repair may be re-contaminated or if low cover exists. If no corrosion exists, concrete repairs can be completed without additional steel treatment and the alkaline repair material will sufficiently protect the steel within the patch similar to new construction. There are many factors to consider when selecting a concrete repair material. 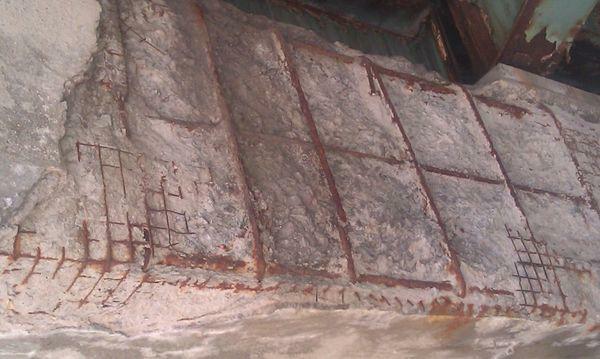 Concrete repair material properties should be specified for the expected application and in-place service environment. Repair materials can include portland cement mortars and concrete, polymer-modified portland cement mortars, epoxy mortars, calcium aluminate mortars, sulfur concrete, or silicate concrete to name a few. For each of these, the modulus of elasticity, thermal expansion characteristics, abrasion resistance, freeze-thaw and scaling resistance, chemical resistance, and setting times will vary. For example, an epoxy mortar may have a differential coefficient of thermal expansion than the parent portland cement concrete. This may be an issue on exterior repairs where temperature swings can stress the bond line. For structural repair where the repair material will be loaded in-service, the selected concrete repair material should have properties similar to the parent concrete such as compressive strength and modulus of elasticity. A good example of structural repairs is when shoring is placed around columns prior to the repair. It can be argued that most repairs are non-structural in nature and greater emphasis given to the durability concrete repair material than physical properties. Important properties that impact durability include cracking resistance (drying shrinkage and modulus of elasticity), permeability and freeze-thaw durability. No matter what property is needed, bond strength is one key to long term durability of repairs. Bond strength is a function of the material properties as well as application such as surface preparation and curing practices. Another key factor in the selection of the concrete repair material is constructability. Constructability is a broad term that encompasses handling properties, rheology and cure times. Concrete repair materials have a range of pumpability, slump, flow and hang / stickiness and can be designed for a specific installation procedure such as form-and-pour repairs, form-and-pump repairs, pre-placed aggregate repairs, tremie concrete repairs, dry pack repairs, trowel-applied vertical and overhead concrete repairs, low velocity wet sprayed repairs and dry sprayed shotcrete repairs. A concrete repair material with a fast set time can be beneficial when there is a need for early return to service, such as bridge deck or parking deck repairs, or to allow coatings and membranes to be replaced sooner. Ready-mix concrete delivered from a local concrete plant is a common material for concrete repair and large parking deck replacements. Ready-mix concrete can be provided with a wide range of material properties including self-consolidating concrete which produces a well consolidated mix with an excellent formed surface finish. Repair materials can also be site batched concrete from a mobile mixer, and a whole range of formulated pre-blended bagged repair mortars and concrete are available from many suppliers. The repair material should be protected from extreme conditions after placement. Repair materials should be protected from windy, dry, or freezing conditions while in the plastic state. Proper curing of concrete repair material is critical to prevent moisture loss, drying shrinkage cracking and curling. Similar to new construction, wet curing and curing compounds will enhance the durability of the repair material. Implementing a quality control program ensures concrete repairs are done correctly. Some basic procedures are documenting the repairs with before and after photos, confirming that the surface preparation is acceptable including observing the cleanliness and surface amplitude or direct tension testing, material testing by a qualified testing agency, sounding the finished repair to detect voids or lack of bonding, and direct tensile bond testing of the cured repair material. Concrete repair is different than new construction, so it's essential to work with experienced concrete repair contractors to ensure the integrity of your structure is upheld. A qualified concrete repair contractor will have demonstrated experience in the specific project environment and an excellent safety record. Industrial plant repairs, cooling tower repairs, parking structure repairs, concrete silo repairs, railroad and DOT bridge repairs, concrete dam repairs, wind turbine foundation repairs, building façade repairs and the repair and preservation of historic structures can have unique access and safety requirements. Specialty concrete repair contractors self-perform most of work needed to preserve and extend the service life of structures. Concrete repair contractors can work as a general contractor but also perform as a specialty subcontractor like a post-tensioned concrete repair contractor, structural strengthening specialist using carbon and glass fiber composites, waterproofing contractor and cathodic protection contractor.